Orlando area brick-and-mortar retail stores are always looking for the best ways to drive sales, and updated retail sign marketing can have a major impact on you business. Customers expect basic retail signs, and those expectations can mean that they overlook and ignore the message you’re trying to communicate. Great retail marketing signs are engaging and clear! Consumers are getting used to more personalized, targeted advertising. This is true online, but also in retail stores. When done right, targeted advertising feels like your retail business is offering a personal touch. For a truly customer-focused retail experience, we find that digital signs get a fantastic response. 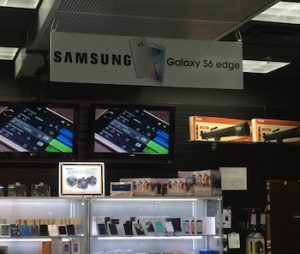 By showing up-to-date sign content all the time, utilizing motion graphics, and even allowing customers to interact with your retail digital signs, you offer a unique, modern customer experience. Do you want engaging signs from a sign company that knows retail marketing? Get in touch with Citrus Sign Studio today! Timing is everything. Repeat customers become long-term sales drivers for your Orlando area retail business, and marketing your sales weeks in advance will convince current customers to return. Use retail signs to advertise specific upcoming product discounts. For instance, if you are running a sale on a selection of sportswear products, place signage in and around your current sportswear department to grab the interest of current customers. Even better, drive customers to your sales by placing large directional signs encouraging them to visit your sportswear section. Are you looking for a sign company in Orlando that will help you stand out from the competition? Get in touch with Citrus Sign Studio today! We have worked on some great Point of Sale signage for local Orlando Businesses. Using the two retail marketing signage ideas above, update Point of Sale signs so that customers can’t help but notice them. By adding variety you can convert a repeat retail browser into a repeat retail customer! Citrus Sign Studio is your Orlando signage company. If you are looking to work with a comprehensive, marketing-focused sign company, get a free quote today!